Godzilla: The Planet Eater (GODZILLA 星を喰う者, Gojira: Hoshi Wo Kû Mono, also known as Godzilla Part 3: The Planet Eater) is a 2018 Japanese computer-animated science fiction kaiju film featuring Godzilla, produced by Toho Animation and animated by Polygon Pictures, in association with Netflix. It is the 34th film in the Godzilla franchise, the 32nd Godzilla film produced by Toho, and the third and final entry in the anime trilogy. It is a sequel to Godzilla: City on the Edge of Battle and is co-directed by Kōbun Shizuno and Hiroyuki Seshita. The film was released theatrically in Japan on November 9, 2018, and released worldwide on Netflix on January 9, 2019. Following the destruction of Mechagodzilla City, the remaining Bilusaludo on the Aratrum demand justice for Haruo destroying what they saw as necessary to defeat Godzilla. But the humans disagree, believing Haruo exposed the Bilusaludos' true intentions of assimilating Earth. The Bilusaludos revolt and shut down the Aratrum's engine room, forcing the ship to run on secondary batteries for the next two days. On Earth, Haruo learns from Dr. Martin that Yuko is rendered brain-dead with the Nanometal in her body keeping her alive. He also learned that those treated by the Houtua survived the nanometal's attempt to absorb them, with Methphies deceiving the survivors into believing their survival was divine intervention. Dr. Martin advises Haruo to hide until tensions ease. When confronted by Haruo over him converting the remaining humans, Methphies reveals his plan to bring the Exifs' god to Earth and needs Haruo's help to make it possible. Haruo is taken to a remote area by Miana, explaining her people have no concept of hatred and that their concept of life revolves around "winning" (surviving and making life) or "losing" (dying and disappearing). She tells Haruo that he is "losing", and offers to sleep with him before he turns her down in her attempt to undress him. While Haruo assumed Miana was the one who treated his wounds, he learns it was actually her twin sister Maina and ends up sleeping with her. Meanwhile, Miana discovers Metphies telepathically communicating with Endurph, the Exif briefly reveals his plans before capturing her as she telepathically contacts Haruo and Maina. Metphies later conducts a ritual with his followers in conjunction with Endurph to summon their god, Ghidorah, to defeat Godzilla. Ghidorah manifests as a shadow on Earth and partially through singularities, devouring Metphies's followers and destroying the Aratrum. Ghidorah then proceeds to attack Godzilla, who is helpless against the intangible monster as its heads bite Godzilla and drain his energy. Dr. Martin concludes that Ghidorah's true form exists in another plane of existence and is being guided by someone in their universe, Haruo finding it to be Metphies who had replaced his right eye with the amulet he repaired with the nanometal. Metphies proceeds to reveal that his people devoted themselves to Ghidorah since learning the absolute truth that their universe is finite and fated to destruction, having worked to offer the monster planets to feed on. Proceeding to telepathically assault Haruo, Metphies explains that the human's hatred towards Godzilla made him an ideal offering and tells Haruo that he must submit himself to Ghidorah as its witness to enable its full manifestation. Maina and Dr. Martin use the Houtuan god's egg to psychically reach Haruo and reveal how to stop Ghidorah, Haruo learning that Metphies orchestrated the deaths of the Tau Ceti e exploration party so they can be "saved". At the same time, Haruo recalls the charm he lost the day he fled from Earth as a boy. Its image of flowers reminds him of his namesake, meaning "Spring", and the power of hope to overcome despair. Haruo then breaks free and cracks Metphies' amulet, causing Ghidorah to become affected by Earth's physics and be ultimately defeated by Godzilla. Metphies dies telling Haruo that Ghidorah will always be watching him as long as he lives. Time passes as survivors bury their weapons and integrate into Houtua society, with Maina pregnant with Haruo's child. Dr. Martin tells Haruo that he got the last remaining Vulture mech working, having discovered how to use Mechagodzilla's Nanometal in Yuko's body as a tool to rebuild civilization as it was. Haruo's right eye stings, hearing Metphies's voice that this turn of events would ensure Ghidorah's eventual return to their reality. Taking Yuko with him, telling Miana that there are times when people face a day where they choose to fight a losing battle, Haruo provokes Godzilla into destroying him and all traces of the nanometal for the good of Houtua. In a post-credits scene, one of the twins watches a group of children conduct a ritual honoring Haruo, placing their prayers under an effigy. The English dubbed version was produced by Post Haste Digital. Takayuki Hattori returned to compose the soundtrack, marking it his fifth Godzilla film score. XAI also returned to perform the film's theme song Live and Die. In May 2018, a teaser poster revealed the film's title, release date, and potential appearance of King Ghidorah. In July 2018, the film's first teaser trailer was released. In September 2018, the film's theatrical poster was released. In October 2018, the full trailer was released. Godzilla: The Planet Eater premiered as the closing film at the Tokyo International Film Festival on November 3, 2018, and was given a theatrical release in Japan on November 9, 2018. The film was released worldwide on Netflix on January 9, 2019. Joshua Meyer from SlashFilm stated "Rather than revert to a big dumb monster movie, The Planet Eater is able to balance its kaiju action with life-and-death concerns while wrapping up threads of character drama woven through the trilogy as a whole. The movie plays with rich themes that might leave you thinking (or scratching your head) as you wait for the post-credits scene." Naoya Fujita from IGN gave the film a rating of 8.0. Fujita felt that getting through Part 1 and Part 2 was a "chore" but felt that Part 3 gave a "strong, more emotional payoff", stating, "While it took awhile to get there, the animated Godzilla trilogy ends with a fascinating chapter that – while unexpected – is worthy of the franchise." Patrick Galvan from Syfy Wire called the film the "best of the three movies", praising the film's expansion on its ideas rather than abandoning them like the previous two films but felt that it still didn't redeem the trilogy, stating the film "has a few things going for it that its two predecessors lacked, but it nonetheless fails — just as they did — to rise above the wall of mediocrity which has rendered this three-film saga the single dullest stretch in the history of the Godzilla franchise to date." Daniel Kurland from Den of Geek awarded the film 3 stars out of 5, feeling the animation was "lackluster" with "Regrettable" CG effects and Hattori's score was "questionable." 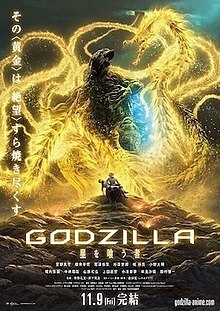 He felt the battle between Godzilla and Ghidorah was "drab" and could have been choreographed better but praised the films themes and concluded by stating, "Godzilla can clearly hold his own within the world of anime." Richard Eisenbeis from Anime News Network awarded the film an overall B-rating, praising the anime's version of Ghidorah is "an incredible take on an iconic character" but criticized the battle between Godzilla and Ghidorah, calling it "the most boring part of the film". He also praised the film's themes of nihilism, hope, and harmony with nature but also calling them "polarizing", stating, "It's a rather extreme message, but this is far from the first pro-environmental Godzilla film. If nothing else, you will be left mulling it over as the credits roll, which is probably exactly what the filmmakers intended." Kai Hellberg from The Daily Free Press criticized the English dub, calling it "embellished" and particularly criticized the melodramatic delivery of Haruo. He also felt the music was "out of place" and concluded by stating, "was not an outright failure. There are certainly captivating scenes and gorgeous animation. But its primary fault is trying to be babied by the legacy of Godzilla, while under the guise of being a modern take on the franchise." Anthony Wendel from Popaxiom stated that the film "doesn’t save the film series. Instead it finds a way to make everything worse and leave a completely bitter taste after the movie comes to an end." He felt Metphies role as the "mouthpiece of Ghidorah" dragged on and felt the battle between Godzilla and Ghidorah was "dull". He concluded by stating the film "wastes any potential for saving the series and is an incredibly disappointing film overall. The sensation of watching this film is reminiscent of watching the disappointment from the Godzilla film Sony made in 1998." ^ a b c d e "Godzilla: The Planet Eater Press Notes, Trailer and Pics From Toho". SciFi Japan. Retrieved October 12, 2018. ^ a b c Aiken, Keith (December 28, 2018). "Godzilla: The Planet Eater English Dub Credits". SciFi Japan. Retrieved December 28, 2018. ^ Aiken, Keith (December 31, 2018). "Godzilla: The Planet Eater — Updated English Dub Credits List". SciFi Japan. Retrieved January 1, 2019. ^ McKalin, Vamien (July 31, 2018). "The First Teaser Trailer for Godzilla: The Planet Eater Is Here". Anime Mojo. Retrieved August 1, 2018. ^ Squires, John (September 13, 2018). "The Poster for Toho's 'Godzilla: The Planet Eater' is a Glorious Treat for Fans of King Ghidorah". Bloody-Disgusting. Retrieved September 13, 2018. ^ Hemmert, Kylie (December 12, 2018). "New Netflix January 2019 Movie and TV Titles Announced". Coming Soon. Retrieved December 12, 2018. ^ Meyer, Joshua (October 30, 2018). "'Godzilla: The Planet Eater' Review: King Ghidorah Helps End Netflix's Anime Godzilla Trilogy in a Grand Fashion". SlashFilm. Retrieved November 5, 2018. ^ Fujita, Naoya (January 10, 2019). "Netflix's Godzilla: The Planet Eater Review". IGN. Retrieved January 11, 2019. ^ Galvan, Patrick (January 10, 2019). "Netflix's Godzilla: The Planet Eater is the Best of a Misfire of a Series". Syfy Wire. Retrieved January 11, 2019. ^ Kurland, Daniel (January 9, 2019). "Godzilla: The Planet Eater Review". Den of Geek. Retrieved January 11, 2019. ^ Eisenbeis, Richard (November 21, 2018). "Godzilla: The Planet Eater - Review". Anime News Network. Retrieved January 11, 2019. ^ Hellberg, Kai (January 20, 2019). "REVIEW: 'Godzilla: The Planet Eater': The King of monsters dethrones himself". The Daily Free Press. Archived from the original on February 28, 2019. Retrieved February 28, 2019. ^ Wendel, Anthony (January 9, 2019). "Review: Godzilla: The Planet Eater Does Not Save The Trilogy". Popaxiom. Archived from the original on February 28, 2019. Retrieved February 28, 2019.